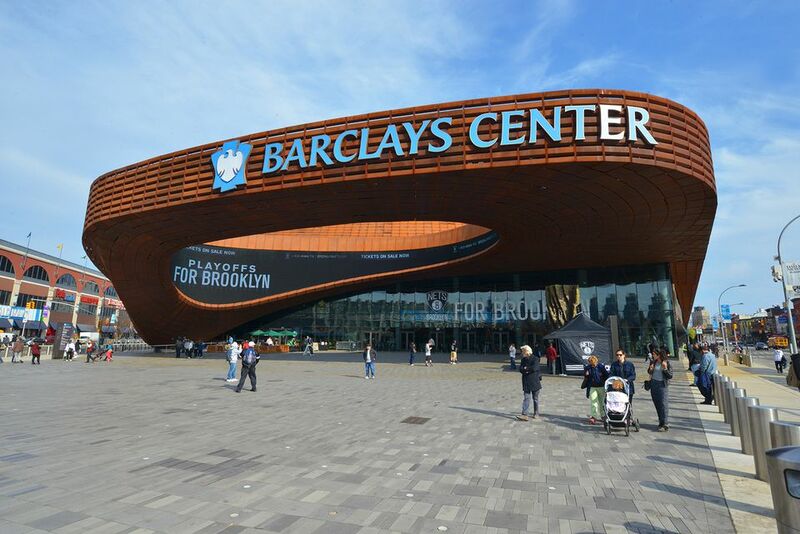 Barclays Center in New York City is located in the borough of Brooklyn, on Flatbush Avenue near 4th Avenue and Atlantic Avenue. It is also near the Brooklyn Academy of Music, and the Atlantic Center Mall area. The main plaza links two major streets in Brooklyn: Atlantic and Flatbush Avenues. Barclays Center is centrally located in one of New York City's biggest subway and train transit hubs, the Atlantic Terminal, also known as Barclays Terminal. It is accessible by taxi cab, car, public transportation, and more. From Jersey City, the bus will take about an hour. Riders can hop on the 81 to the PATH and then walk to the subway. Depending on the time of day, riders will have several options to take different trains into the city. Taking the train from the Central Park Zoo is as simple as hopping on the green line from 59 St at Lexington Ave Station which tends to run every 12 minutes. Other times, riders can take the N or Q lines. All rides take roughly 35-45 minutes. From Staten Island, riders can take a bus to the R train in Brooklyn. When coming from Jersey City, travelers can take the Holland Tunnel which can take an average of 40 minutes depending on the hour of day and traffic. It's roughly about 8 miles away by this route. From Central Park, drive via FDR drive, a 35-minute commute that's roughly 8.6 miles away. Coming from the John F. Kennedy International Airport (JFK), drivers can go toward N Conduit Ave or Belt Parkway and Atlantic Ave, a 35-45 minute commute. Finally, from Staten Island, individuals can take I-278 east for 32 minutes, a 16.6-mile distance. Note that street parking is limited, so public transportation is recommended. Biking is a great option for those who want to skip public transportation and get some fresh air. From Jersey City, biking to Barclays Center will take about 7 miles via Grand St.
Coming from Central Park, biking will take about 1-hour via 2nd ave, the Hudson River Greenway, or the Williamsburg bridge bicycle path. Similar paths can be taken from surrounding areas such as the Upper East Side, or Midtown. From Staten Island, bikers can cycle toward the Staten Island Ferry exit and ride the ferry about 5.2 miles to Barclays Stadium.